UFC 215 is held on Saturday September 9 at Rogers Place in Edmonton. On Monday the Ultimate Fighting Championship announced that UFC 215 is held on September 9 at Rogers Place in Edmonton, Alberta, Canada. The show is the first gala held in the city. In addition, it is the second promotion in the country this year. Fight Night 105 Lewis vs Browne was held at Scotiabank Centre in Halifax in February. The event was originally expected to be UFC 216. However following the cancellation of a PPV installment on August 19, UFC 215 is happening instead. The main card airs on Pay-Per-View. The preliminary program is expected on Fox Sports 1 and UFC Fight Pass. 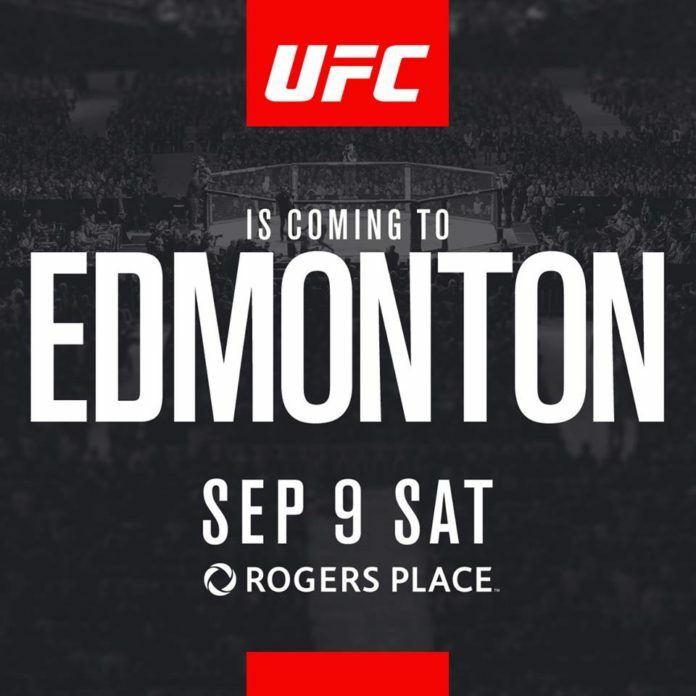 “UFC announced Monday that UFC 215 will take place on September 9 at Rogers Place in Edmonton, Alberta, Canada. The event marks the promotion’s first visit to Edmonton. An originally planned August Pay-Per-View event has been removed from the schedule,” says the UFC 215 announcement. No main event bout has been announced to date. Four bouts featured on the card have been revealed. The program includes a flyweight contest between Henry Cejudo (10-2-0) of the US and Wilson Reis 22-7-0 of Brazil. Also, American Rick Glenn (19-4-1) meets the representative of the country-host Gavin Tucker (10-0-0). As well, Ashlee Evans-Smith (5-2-0) of the US squares of against Sarah Moras (4-3-0) of Canada. In addition, Arjan Bhullar (6-0-0) of Canada makes his UFC debut taking on Brazilian Luis Henrique (10-3-0, 1 NC).